While Fentonites drove home from work or sat down for their evening meal, the light through the curtains awoke me for the new day in the city of Singapore. Opening the sliding door to the balcony dissipated the cool air delivered by the conditioner during the night. I saw the apartment building across the blue of the swimming pool that separates the two buildings. The lights in the filter towers which sit like Japanese lanterns in the shallow water turned off as I gazed at the sky. A blanket of white clouds covered the direction I looked. However darker clouds had already passed me by. I wondered if it was raining on the other side of the island. It was too early to wake my wife. Perhaps I could silently make a cup of coffee and read yesterday’s paper to see what is happening in this country called Singapore. Many people do not realize that Singapore city, island and country are all the same place. Home to approximately five million people it is located close to the Equator in Asia. A mere five hour plane trip and you can be in either Australia or Hong Kong depending on what direction you fly. The inhabitant’s descendants arrived mostly from China, Malaysia or India. The country has one of the lowest crime rates in the world and has the World’s third highest gross national product per person. On this day my wife and I caught the shuttle bus to the mall. From there we boarded Singapore’s clean and efficient mass rapid transit system for the Botanical Gardens. Last year the trip required a two hour ride on one of the double-decker buses. Since that time they completed the Circle Line which drops the rider off at the garden’s entrance. Canopies of flowers began our adventure. Green and white signs lead us along the asphalt footpaths to the many different places in the gardens. The Evolution Garden is a 20 minute walk documenting how the earth has evolved over millions of years. There, we came across a couple having unique professional wedding photos made. 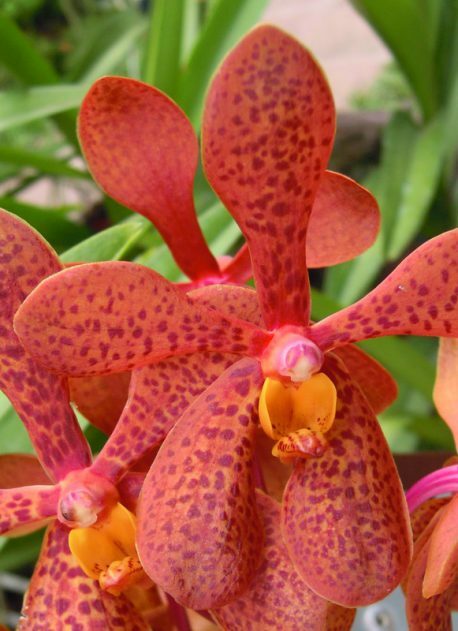 The Ginger Garden as well as the Orchid Garden are our favorites. In another location of the large facility, a 15 minute walk took us through a rainforest providing a short glimpse of what all of Singapore was like at one time in history. The visitors’ center is located in the middle of the park. My wife and I made it there just as a rain storm broke. We took in a wonderful display by Mother Nature while enjoying a cup of coffee. Perhaps it is best that I just let the photos do the rest of the talking.